The MESA-7220 is based on the latest advances in Energy Dispersive X-ray Fluorescence (EDXRF) technology. It features diffractive optics for ultra high performance for low atomic elements - specifically S and Cl - in oils and other fluids. This approach is critical for a user to achieve the ultra low noise background for the best limits of detection for S, Cl, and other elements. The MESA 7220 is a specialized, compact XRF workstation that offers superior measurement of S and Cl in petroleum-based products. MESA 7220 technology is based on the latest tube and detector technologies in Energy Dispersive X-ray Fluorescence (EDXRF) and utilizing closely coupled monochromatic, polarized EDXRF analysis techniques. 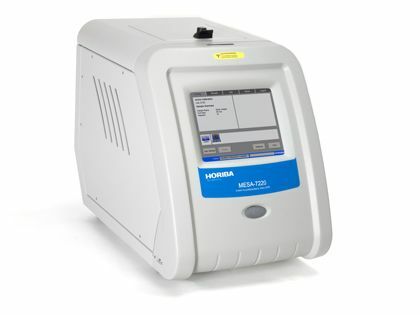 It was developed specially for HORIBA Scientific Elemental Analyzers Product Line utilizing Olympus field-proven EDXRF technology that originated from on-board oil and fuel analysis specially built for the marine shipping industry. For additional information on the MESA 7220 from our exclusive distributor, please visit the Horiba website.